Long before year-end sales blitzes, WeDriveU helps automakers and marketing agencies engage consumers and stay top-of-mind. 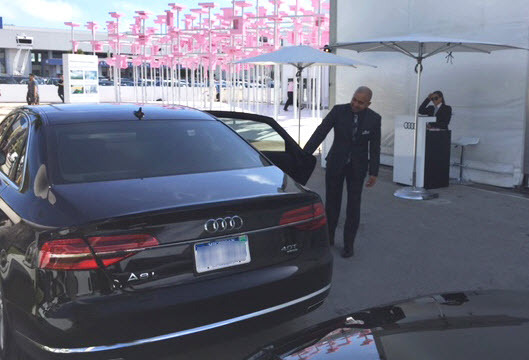 This VIP Car Service we rolled out at a premier art event in Miami is an example of these ongoing Experiential Marketing campaigns led by our Program Solutions team. The client’s agency wanted to provide premium transportation for VIP guests and executives as part of the automaker’s sponsorship of DesignMiami/ from December 2 – 6, 2015. A WeDriveU client since 2007, the automaker has a long history of supporting this forum for the international art and design scene – one that attracts luxury brands, such as Swarovski, Fendi and Perrier-Jouët. WeDriveU managed the official VIP Car Service for the nine-day program. Serving as brand ambassadors, the team orchestrated transportation within Miami Beach and downtown to VIP events, art galleries, design districts, hotels and dinner and entertainment venues. WeDriveU’s onsite management involved 30 professional WeDriveU drivers and experienced managers staffing the VIP concierge desk and overseeing the pickup/dropoff area, dispatching and fleet management.